If you connect a USB device to the USB port, and the USB port stop responding, so your USB device will not recognize by Windows 10. You can try to plug it into another USB port to have a try. Especially if it has USB 2.0 ports, try to plug it into the USB 2.0 port. 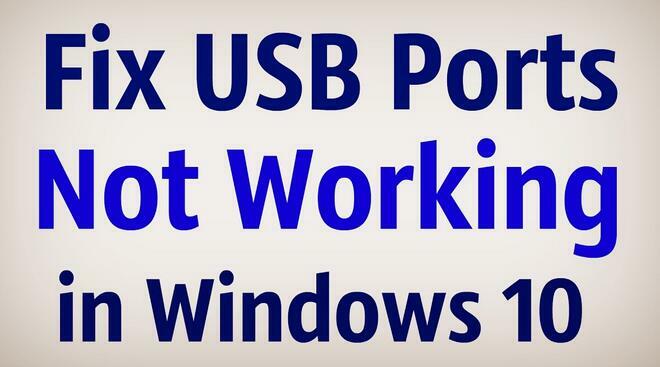 Some USB devices may not work in USB 3.0 port, but it will work on USB 2.0 port. 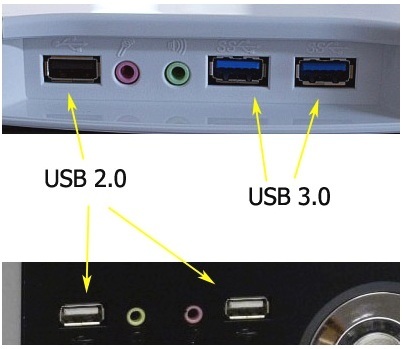 The USB 3.0 Port is blue and the USB 2.0 port is black or white. If you are using a laptop, and your USB ports had not response when you plug a USB device to it, maybe it is the power problem. The computer may have a problem to supply power for the USB devices and USB ports. So reset it will be a choice. 1. Unplug the laptop supply and charger plug from your computer. 2. Wait for several minutes, for some of the manufacturer laptops such as HP, maybe need 15 minutes. 3. Then plug the laptop supply and charger again. 5. Connect the USB devices to the USB ports to have a try. 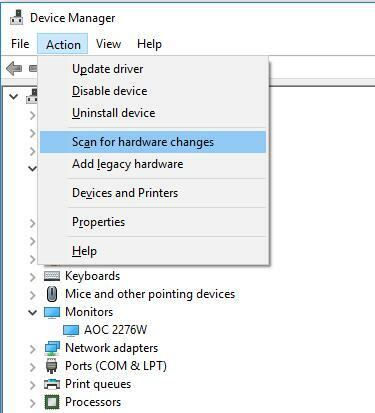 Windows will detect the new hardware after rebooting the computer or by the scan for hardware changes function in device manager. So you can plug the USB device and reboot the computer again to check if the USB port works or not. Of course, if you have no idea to reboot, you can scan for hardware changes. 1. Enter device manager. And you can view ways here. 2. Click the scan for hardware changes icon in the view drop-down option. This will help scan for all the added and removed hardware. If the system detects one device is added to the computer such as you connected a USB device to USB port, it will add it to device manager list and windows will install the driver for the device automatically. If the driver cannot be installed correctly, it will show as a yellow exclamation. Of course, if one device is removed from the computer such as you plugged out an USB device, it will also be deleted from device manager. 3. If the scan for hardware changes cannot help, try to restart the computer again to check if the computer can identify the USB devices. Now maybe after scanning for hardware changes, your USB ports can work properly. If the problem does not fix, try next solutions. Sometimes because of the power save settings for the USB devices, the USB devices will unresponsive. So you can disable this setting in the USB root hub. 1. Open device manager and expand Universal Serial Bus Controllers. 2. Find the USB Root hub or USB Root Hub (3.0), right-click it and choose Properties. 3. 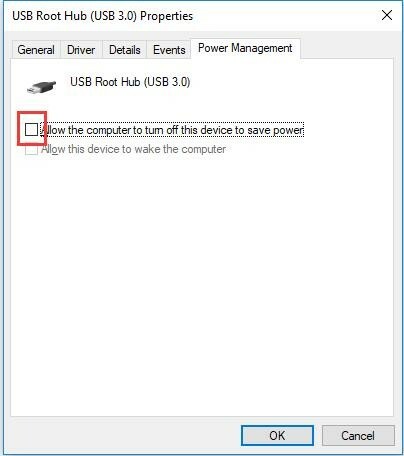 Locate Power Management tab in the USB Root HUB Properties window, and uncheck the option: Allow the computer to turn off this device to save power. This will allow USB devices use the system power anytime. 4. Find all the USB Root HUB and uncheck this option. After that, connect the USB devices to check if it can work or not. And if you can do nothing about this option because it is grayed out or missing, here is the solution: how to fix allow the computer to turn off this device to save power grayed out problem. The USB controller will be the reason to disable USB ports response. So you can disable the USB controller and enable it again. 1. Enter the device manager and expand Universal Serial Bus Controllers. 2. 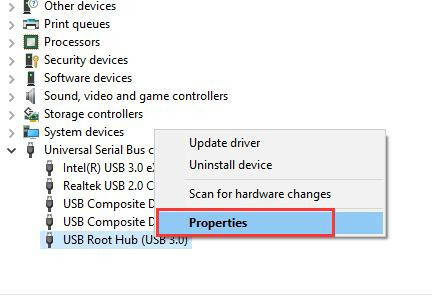 Find the USB controller, right-click it and choose Uninstall device, this will uninstall the USB controller. 3. Find other USB controllers to uninstall them one by one. 4. Restart the computer after all the USB controllers uninstalled. After Windows 10 restart, the system will automatically scan for hardware changes and reinstall all the USB controllers again. The USB ports cannot work properly may be caused by the USB devices driver or the related drivers such as the motherboard and chipset drivers. So updating drivers can help to solve it. 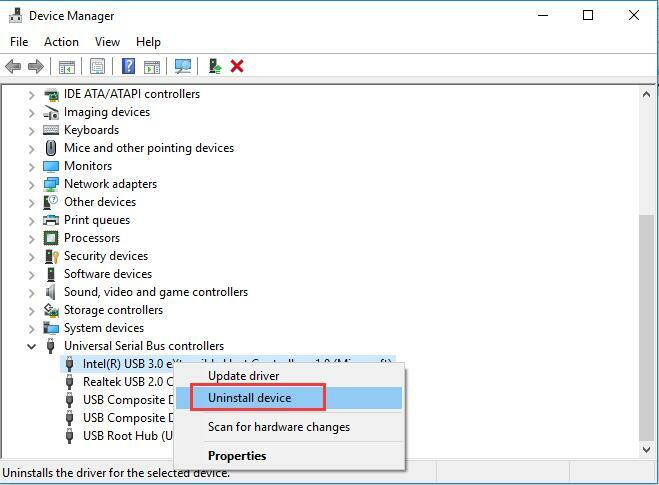 For updating the drivers, you can enter the device manager to update it or download the drivers from the device manufacturer’s website and install it manually. Of course, if you have a problem with updating it by yourself, you can use Driver Doctor to help you. It can fix the driver issues easily and fast. You do not know about more knowledge about the drivers and computer. Driver Doctor can help scan all the devices, including the plugged in USB devices, chipset devices, motherboard and its ports. 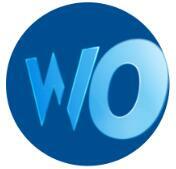 Then recommend the latest drivers for you to download and update. After all the USB devices drivers updated, you can connect it to the USB port to check it again. Wish these solutions can make your USB ports work normally and the USB devices can be recognized by Windows 10.